I had some pipian leftover from my turkey and pipian meal and I was wondering what I could use it for. The idea that most interested me was using the pipian to make some egg enchiladas for breakfast. It had been a while since I had last had enchiladas and I could just imagine them with a nice layer of golden brown melted cheese on top of the egg filled tortillas covered in moist pipian. I like h savoury foods for breakfast and the pipian egg enchiladas sounded like a great idea. I decided to keep it simple and I just scrambled the eggs (though you could easily use chopped hard boiled eggs) with some green onions for the filing. The enchiladas were pretty easy to make though they did need to bake for a while so they were not a quick breakfast, but perfect for a weekend. I still had a bit of pipian left and spread it out on the plates before serving the enchiladas on top. The egg enchiladas were nice and moist and the pipian worked well with the eggs and of course the cheesed helped as well. It was certainly a tasty breakfast! Spread a bit of the pipian on the bottom of your 8 inch square baking pan. Dip the tortilla into the pipian. Place some scrambled eggs onto the tortilla and wrap it up. Place the egg enchiladas into a baking pan and cover with the remaining pipian followed by the cheese. Bake in an oven until the pipian is bubbling and the cheese has meted and turned golden brown, about 20-30 minutes. I don’t like eggs alone all that well, but I do love all of the interesting things you can do with them! Yes, that is a TASTY breakfast! Your food photography is always so captivating!! mmm. your pipian looks delicious, as do these egg enchiladas! what a great breakfast! Kevin, your enchiladas look delish! I am not familiar with pipian so really appreciate your post on that interesting dish. I hope to try it soon. Thanks! Kevin, when are you opening a restaurant. I love everything you make. Looks so delicious. Yummmmm! These look outstanding. I’m getting caught up on your posts, and your entire theme has just been wonderful …. that pipian, the rice, and now this. I’m a HUGE egg fan and would gobble this up as fast as I could. YUM! The sounds good! 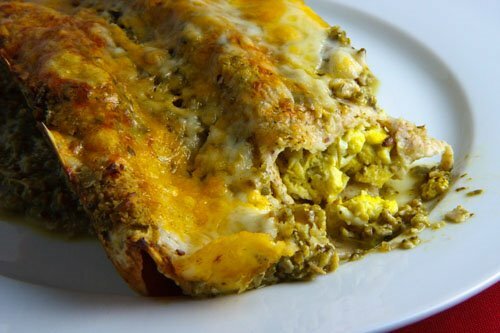 I’ve had egg burritos before, but never egg enchiladas. I wonder what the difference is?? Everything this week all looks SO good, Kevin! As always! Wow, another great, tasty idea! Thanks for sharing Kevin! Love the versatility of eggs. Looks and sounds really good! What a great way to start off the day. What a crative idea. I love eggs, but have never had them in an enchilada, I’ll have to try this out. God Kevin that sounds insanely good! This looks ridiculously good. I love eggs with these kinds of flavors, like huevos rancheros. Mmm, I’m droolng! That looks like the BEST breakfast. I’d jump out of bed for that! Looks very interesting Kevin, it sounds like something my husband would really like. I just realized I had the biggest craving for some eggs. And then I saw this post. Looks soooooo good!! That seems like a great way to use the Pipian you made! Now that looks like the kind of breakfast my husband would *love* on weekends! I wish this is what I ate for breakfast this morning but sorry to say it was a cereal bar. This looks so much better. Kevin, you are so creative. I’ve never thought of egg enchiladas. Delicious! I had these at my favorite Veracruzana place, and they’re so good as a hangover cure. Great idea! I love the thought of pipian with eggs. I love how you jazzed up the eggs!! Your recipes amaze me! This one sounds great. I love eggs and I love enchiladas! I had missed your pipian recipe. I’m glad you linked it so I could catch up. This looks awesome. Wow, these look and sound amazing!! Great idea!! Kevin You taught me something today, I didn’t know what pipian was! Your enchilada looks wonderful! What a unique creation Kevin. Pipian is new to me but it sounds like something I would enjoy very much. I love enchiladas, I am going to be making some soon myself. This is a great take on it and an original idea. I had never heard of pipian until now but I did check out your post on it and it sounds great.